A 3D model of Kepler. NASA’s $600 million Kepler space telescope, which is more or less running on thruster fuel fumes nearly a decade after its launch in 2009, woke up from a four-week hibernation phase on Thursday and is transmitting data back to Earth, Space.com reported on Friday. If all goes well, it may even be capable of continuing its mission to detect more exoplanets in distant star systems. After waking from its hibernation, Kepler began transmitting the data it gathered from the 18th 80-day survey of its “K2" phase—an extension of its original mission launched after the craft suffered a mechanical malfunction in its steering system in 2013—via NASA’s Deep Space Network, an array of receiver dishes around the globe. 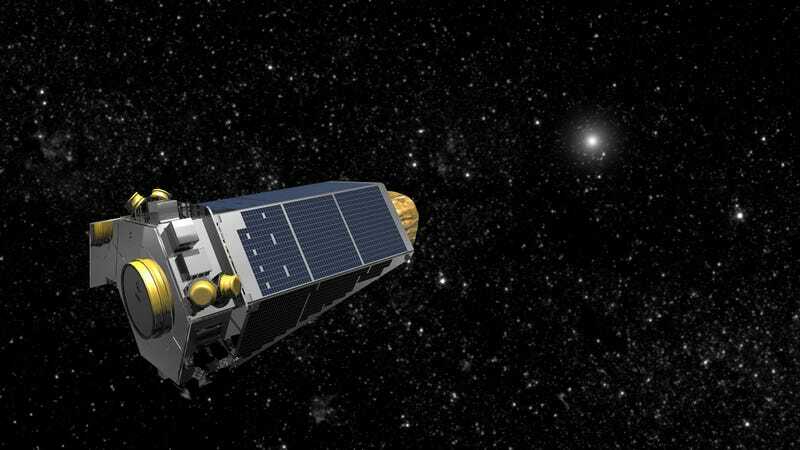 If there is remaining fuel, NASA staff may try to use Kepler for a 19th observation mission. During its original phase, Kepler scanned 150,000 stars, eventually discovering 2,244 candidate exoplanets and 2,327 confirmed exoplanets. The extended K2 phase of the mission, which uses a workaround involving the pressure of the sun’s rays to help stabilize Kepler following the steering system malfunction, is imperfect—but it’s still identified some 479 candidate exoplanets and confirmed 323 others. Kepler identifies exoplanets via what is called the “transit method”—which basically means observing the tiny changes in a star’s observable incandescence as orbiting planets pass between the star and Kepler. Its discoveries have included that roughly 20 percent of stars like our own sun have habitable zones containing at least one planet—and that it is also likely that many star systems have giant planets with moons large enough to potentially harbor life. In 2015, the Kepler team announced the discovery of Kepler 542-b, one of the most Earth-like planets in terms of its star, orbit, and size ever detected. The Transiting Exoplanet Survey Satellite (TESS), Kepler’s successor, has the capacity to look at much brighter stars than Kepler, do a limited amount of spectroscopy to help determine exoplanets’ chemical composition, and will be especially good at surveying planets in the orbits of red dwarfs. Unlike Kepler, which trails Earth’s orbit at a distance of roughly 94 million miles, it orbits our planet. TESS recently began operations, though more serious observation of exoplanets will have to wait for the upcoming James Webb Space Telescope or as far off as the 2040s, when telescopes capable of picking up on biosignatures that could be indicative of life may be in orbit.